2.2(+eh).2(+bc).2 / 4.2.2.1 / Timp. / 2 Perc. / Str. Freylekhe Tanzen was composed between October and December 2011 in partial fulfillment of my MA in Composition at the University of Michigan. 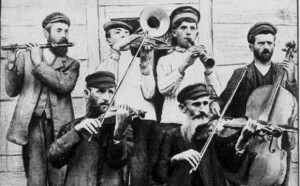 The work is heavily steeped in the liturgical and folk music of European Jewry, drawing on the iconic blasts of the shofar (ram’s horn) and Klezmer tunes from Romania, Bulgaria, Spain, and Russia. It also features melodic and rhythmic elements inspired by Karnatak music (the classical tradition of Southeast India). The title, Freylekhe Tanzen, means “joyous dances” in Yiddish. The first half of the piece centers on a slow 3/4 dance style known as a Zhok, a cousin of the jig, and the second half of the piece focuses on a lively duple meter style known as a Freylekh, the cornerstone dance style of Klezmer literature before the mid-20th century.